Student Conservation Team Gets Their Hands Dirty! Student Conservation Team Gets Their Hands Dirty at the Arboretum! 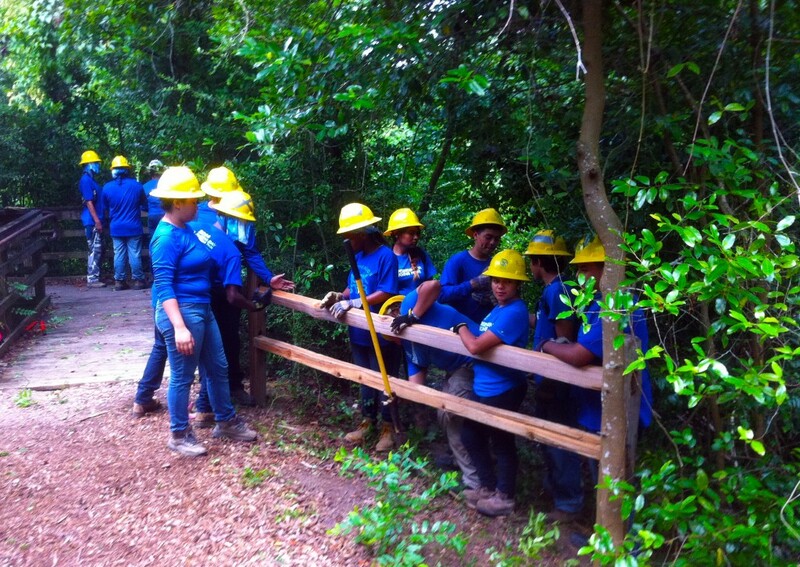 The Student Conservation Association working the trails at the Houston Arboretum. Most teenagers probably wouldn’t look forward to spending their highly coveted summer days working outside and digging their hands in the dirt. But the ambitious young people from the Student Conservation Association are not most teens. These students are passionate about preserving our natural environment, so much so that they choose to use their free time doing just that. The Student Conservation Association (SCA) is a national organization whose mission is to connect young people with hands-on environmental challenges and face them with real life restoration projects. Students register with SCA and the program connects them with local conservation based non-profits, like the Houston Arboretum. Fun fact: Since 1957, more than 70,000 young people have joined the ranks of SCA and have provided more than 28 million hours of hands-on service to the community and the environment. In early August a team of 24 amazing high school students from SCA came to the Houston Arboretum to volunteer and assist with our conservation efforts. The teens broke into two groups of 12 and took to the trails with 2 college level crew leaders. As local Houston residents, these students care about the green spaces in their city and want to see them succeed. After 8 days and a grand total of 749 man hours of hard work, the progress the students made was invaluable. They removed invasive species from an impressive 1.4 acres of Arboretum land! They made strides towards eliminating the invasive Chinese privet, glossy privet, Chinese tallow, Mexican hydrangea, Japanese honeysuckle, and skunk vine that compete with our native flora. In the areas freshly cleared of invasive plants, they spread the grass and wildflower seeds they had collected from other parts of the Arboretum. Second fun fact: we have hired two of our full-time employees after they interned with us through the SCA program. In addition to their work with our foliage, the students reestablished drainage along 639 feet of our outer loop trail. With shovels in hand they dug ditches adjacent to the trail and repaired areas where the trail had begun to wash out. Their improved drainage will prevent rain water from flowing on the trail itself and save us time and money on repairs. That still isn’t it, the students also had time to install and replace 100′ of split rail fencing, a very important feature here at the Arboretum. The fences encourage people to stay on the trail, ensuring that our off trail areas are reserved for wildlife. Keeping visitors on the trails creates a safer environment and reduces erosion on our banks. Students from the SCA made our bat populations very happy while they were here. They raised one of our bat boxes in the meadow from a height of 8′ to 14′. When bats leave their box, they drop from the roost and need a clearance to begin their ascent. So higher boxes are much more attractive homes to them. We applaud these amazing young people for their dedication to the environment, and the SCA for empowering our new generations of conservation leaders. We are honored with the opportunity to provide students the chance to experience firsthand what it means to be a conservationist at the Arboretum. We hope the students found their experience here to be educational and fun, and that they enjoyed working with us as much as we enjoyed working with them!